The Night Mother (a.k.a. Unholy Matron) is the spiritual leader of the Dark Brotherhood. She receives prayers from people seeking to arrange assassinations, and relays those desires to the Listener of the Black Hand. The Night Mother's ghost wears a red velvet garment and a red velvet blouse. She can be found in her crypt in Bravil, however she cannot be accessed until stage 30 of the Honor Thy Mother quest and will be inaccessible after stage 60. According to Dark Brotherhood beliefs, she is the wife of Sithis and bore five children. This is supported by the fact that there are the skeletal remains of one adult and five children in her tomb, representing the mother and her children in Dark Brotherhood beliefs. 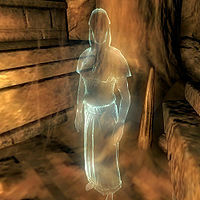 In the game, she appears in ethereal form in her crypt during the final Dark Brotherhood quest, Honor Thy Mother. Night Mother: "What is the meaning of this desecration? Who has disturbed my ancient slumber?" Arquen: "Dearest Night Mother! Most Unholy Maiden! Please, we beg your mercy in this, our time of need! The Black Hand seeks your guidance!" Night Mother: "Ah, yes, I have been expecting you. The Listener now kneels by Sithis, as does his successor. There is a traitor amongst you. Arquen: "The traitor is dead, dear Mother. We have come now to ask your blessing. Anoint one of us your Listener, so we can restore the Black Hand!" Night Mother: "Foolish little girl. Lucien Lachance served Sithis til his dying breath. The Black Hand remains tainted by betrayal. Restoration is impossible." Suddenly, Mathieu Bellamont, will draw his blade, kill the other two Black Hand members, and attack the Night Mother. After slaying Bellamont, The Night Mother will approach you and initiate conversation "So, at last we meet. I have been following your strange journey through the Dark Brotherhood, young one. Your killing of the old man, Baenlin... the execution of Adamus Phillida... the way you stalked and murdered each member of the Draconis family... Your Purification of the Cheydinhal Sanctuary. You, a mere underling, even managed to single-handedly eliminate half of my Black Hand!". "I live only to serve the Black Hand"
"I know, dear child. I know. You carried out your orders to the letter, in the name of the Black Hand. How could I be anything but happy with you? No, my anger lies with the rest of my children. You see, I have known of Mathieu Bellamont's intentions since he was just a boy. " "Ha! I reveled in their slaughter!" "So you did, my child. So you did! Ha ha ha ha ha! You obeyed your orders and showed no mercy or remorse. How could I ask for a better servant? If only my other children had served me so well! You see, I have known of Mathieu Bellamont's intentions since he was just a boy. " "Ah, you choose to play the stoic, hmm? You remain silent even when faced with my terrible countenance? Your silent obedience is to be commended. If only my other children had offered such reverence. You see, I have known of Mathieu Bellamont's intentions since he was just a boy. " Either way she will continue with: "I knew of his thirst for vengeance. I could have informed my Listener. But I refused! Refused to reward such incompetence! Ungolim was weak. Indeed, I allowed Mathieu Bellamont to proceed on his destructive course. Just as I allowed you to intercept him." "But... But why, honored Night Mother?" "Don't you see? Our Dread Father foresaw your defeat of the traitor, here in this very crypt! You have been chosen! You are to be my new Listener!" "Yes, dear child! Yes! The Dread Father foresaw it all! You were meant to kill the traitor! You were meant to be named Listener of the Black Hand!" "Our Dread Father foresaw your defeat of the traitor, here in this very crypt! You have been chosen! You are to be my new Listener!" She will again continue with: "You possess strength, and cunning, and a heart as black as midnight. You were marked by Sithis the moment you emerged from your mother's womb." "So what happens now, Unholy Matron?" "Go. Take a few moments to collect yourself. Meditate upon all that has transpired. Help yourself to any treasures this crypt may offer. " "Finally, the authority I deserve!" "You will get what you desire. But first, meditate upon all that has transpired. Perhaps you covet treasure? Take all my crypt has to offer!" "Silent even as Listener? Good. For now is the time to meditate upon all that has transpired. And please, help yourself to this crypt's treasures." She finally conclude with: "When you are ready, speak with me again, and I will deliver you safely to the only place you can truly call home -- the Cheydinhal Sanctuary! There is much work to be done. When you are back in the Sanctuary, speak with Arquen. She will serve as your humble servant and guide." Speaking to her after either raiding the crypt or simply directly after will result in the following: "You've returned. I trust you've weighed the importance of your new position. For you will soon hear words that will change lives, alter destinies. And I hope you've taken everything you desire from my crypt. Once you leave, you will be unable to return. Now, are you ready to begin your new life?" "No. I'll return when I'm ready." "Very well. Take your time. Enjoy the hospitalities of my... home. Ha ha ha ha ha ha ha!" "I'm ready. Send me to the Sanctuary." "Very good! Now begins your true journey! We will soon become very intimate, you and I! Ha ha ha ha ha! Before I sent you away, however, I would like to present you with a rather special reward. I see you still possess the Blade of Woe, the weapon given to you by Lucien Lachance when you first met. Allow me now to unlock its true power! Yes, you will now find the Blade of Woe a bit more... potent than it was. Now go. Leave this crypt, and serve our Dread Father til your dying breath!" More info on the Night Mother can be found on her Lore article. As documented in the rare and taboo work "A Kiss, Sweet Mother," the Black Sacrament involves an effigy of the intended victim -- created from actual body parts, including a heart, skull, bones and flesh -- within a circle of candles. To proceed with the ritual, one must stab the effigy repeatedly with a dagger rubbed with the petals of a Nightshade plant, while whispering the plea, "Sweet Mother, sweet Mother, send your child unto me, for the sins of the unworthy must be baptized in blood and fear." As gruesome as this ritual may be, even more frightening is its intention -- the summoning of a mysterious assassin (who some witnesseses [sic] claim is always clad in a black hooded robe) who will then receive money to kill an innocent victim. No remorse. No regret. It is, as the merchant's say, simply business. And that's what worries Adamus Phillida. Honor Thy Mother: Root out the traitor and end his trail of carnage. In the game, the Night Mother is the leader of the Dark Brotherhood. However, in the construction set, she is only listed as a Murderer. The information listed in the summary box is the construction set faction, because this is the information that controls the NPC's disposition, dialogues, and responses to scripts; see Factions for details. Oblivion indicates that there is a single Night Mother, the ghost of a woman who formed the Dark Brotherhood. In Morrowind, an Imperial woman named Severa Magia was identified as the local Night Mother of the Dark Brotherhood in Vvardenfell. It is possible that the term is used to indicate a local leader as well as the Unholy Matron herself. More information can be found on the Lore article. Esta página foi modificada pela última vez à(s) 21h35min de 10 de março de 2016.